And, as is my wont, I will procrastinate everything just a bit more to share links to some of the things I think would be lovely to get or give to help in the kitchen. Unfortunately I am not techie enough to sort representative images for you to see without really messing with the lay-out, so please do click on the links and find out more. The products are a mix of US and UK, but Anthropologie pieces will be in both countries. It may be too late to get most of these for Christmas but maybe you’ll bookmark one or two for another occasion. A quirky and up-to-the-minute source of ideas – and I deliberately don’t have an active account for reasons that will be clear if you click through – is Pinterest.com. I could waste a ridiculous amount of time messing around on this site. Only click if you have at least an hour to ‘ooh’ and ‘ahh’. I’m not sure how people have the time to curate their collections, but I am full of admiration. First off, for the design, colour and architecture fiends among you, my great friend Niki has designed some extremely original, industrial-chic tea towels. They would look stunning in a sleek modern kitchen, or framed and hung on a sitting room wall (white, of course). Niki is an expert in colour, consulting far and wide on the subject, and has used her expertise to come up with some covetable all-Scottish made union linen cloths. They are available online and in-store through Moleta Munro, and in person at Concrete Wardrobe (Edinburgh) and Red Door Gallery (all three in Edinburgh). 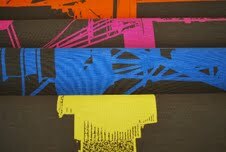 This is the first of Niki’s textiles to come out, with luxury cashmere line onstream soon. Can’t wait! A wee photo of my fave. Going a bit lower brow, I wouldn’t mind this cute panda cleaning my computer screen. Such a sweet stocking filler! And I fancy a challenge, so I want to tackle Heston Blumenthal At Home. Or I might just buy his goodies from Waitrose. Here’s a link if you fancy a challenge, too. Other cookbooks I wouldn’t mind getting, or buying for someone and borrowing, are Hugh Fearnley-Whittingstall’s latest, Scandalicious: Secrets of Scandinavian Cooking from Signe Johanson (no one who makes cardamom buns should look as gorgeous as her), Ancient Grains for Modern Meals by Maria Speck, and Veggiestan, a superb-looking (and cleverly titled) book on Middle Eastern vegetable dishes by, err, Sally Butcher. I might need this rustic yet modern grater if I get any of the above. Made from walnut and stainless steel, how great would this look in your kitchen? Who wouldn’t want to bake a cake in this (decidedly non-chintzy) pinny? And wash down a piece of that cake with milk out of this recycled glass tumbler? What a statement this mason jar chandelier would make in your kitchen. Homespun, yet sophisticated. Love it! So, now for the recipe, and usual wee lecture/rant. Mexican hot chocolate is a slippery thing. Not just if you actually slid in a spilled puddle of the stuff, but its confusing history. Basically no one has a definitive history for this extremely widespread and beloved drink. We do know that chocolate as a drink and food-stuff originated during the Mayan heyday of the 5th century. In between sacrificing virgins into raging volcanoes, Mayan elders found time to grind cocoa beans to a coarse paste and mix it with chilli peppers, water and thickening maizemeal. No sugar. I can’t imagine this concoction being anything other than medicinal (treating stomach ailments apparently). It wasn’t until sugar was more widely available in 17th century Europe that chocolate was sweetened and gracing the tables of nobility. 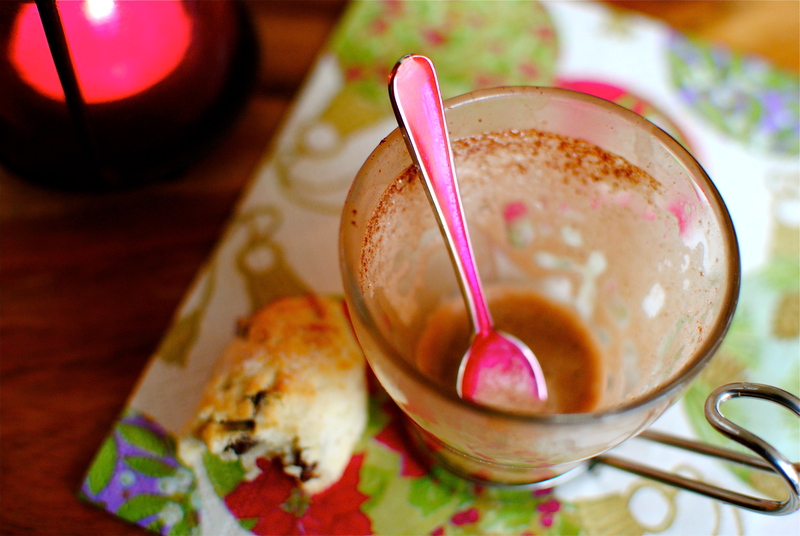 Even quite recently Mexican hot chocolate was pounded cocoa beans, all nubbly and bitter, mixed with just enough sugar to make it palatable. Today many of us use cocoa that has been processed with a potassium solution (such as potassium carbonate) to neutralise the acidity, commonly referred to as ‘Dutching”. Dutched cocoa is always much darker than non-Dutched but are often interchangeable in recipes. As there are exceptions, here is a link to Fine Cooking, which gives more specific guidance. From what I have read true Mexican hot chocolate today is essentially cocoa, often tablets of it, sweetened with copious amounts of sugar, more sugar and a touch of cinnamon. When I was last at home in Tampa I tried the popular Mexican brand “Abuelita”, but from what I hear and have read, this is not truly authentic. Thank goodness for that. A read of the ingredients speaks volumes for how “Big Food” can drag a nutritious, real food over to the dark side. Trust Nestle to put a sweet old lady on the label, all lace sleeves, white hair and end-of-nose specs, and bung unnecessary ingredients inside. I admit the taste is quite nice (can’t believe I am admitting this) and the quaint tissue paper wrapping each tablet is quite cute, but Lordy, the ingredients: sugar, chocolate processed with alkali, soy lecithin, vegetable oils (palm, shea nut and/or illipe nut), artificial flavor, and something called PGR (emulsifier). Helpfully (bless them), it asks us to remember that “prepared with skim milk (as if), each cup of Abuelita chocolate beverage is a delicious way to help meet your daily milk intake (so they are even pushing milk as a necessity). The Dietary Guidelines for Americans recommend 3 cups of milk daily for adults.” Truly, the mind boggles. As you can see below, we can neatly avoid all the rubbish in prepared cocoa mixes (most have similarly dispiriting labels) by making your own. 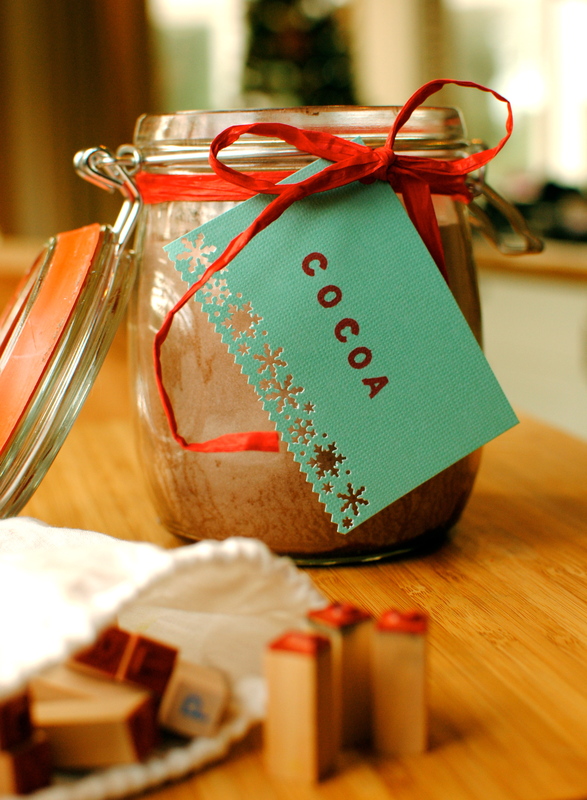 It takes all of five minutes to put together a big jar of chocolate heaven. I have added in chilli as a nod to current fashion for heat in fancy chocolate and cocoa, but I have left it out in the second version if you want to make it up for children. 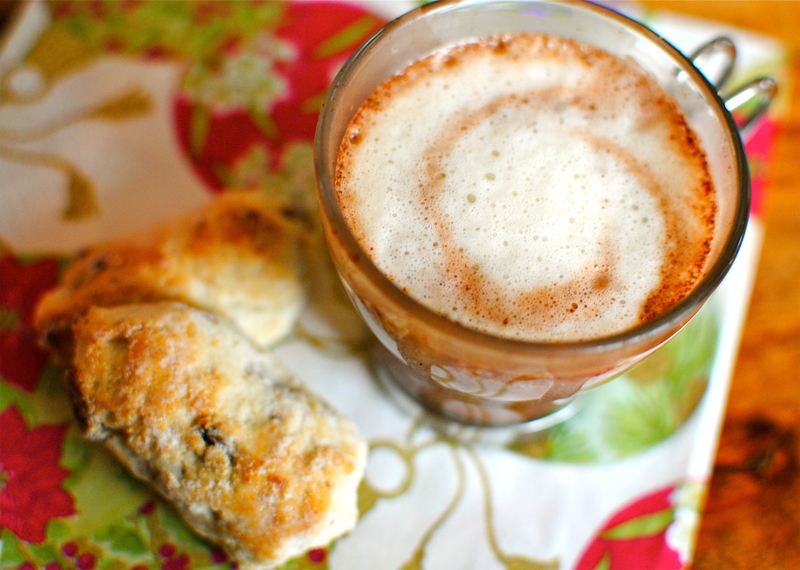 The currently authentic ingredient of cinnamon is here, as is a touch of optional cardamom. I have seen the latter in a few historical references so as a lover of cardamom I add this in, but leave it out if you like – it does complement the chilli and cinnamon though. For the kids’ version I have added some vanilla powder but just use the pumped up cinnamon if you can’t easily get this rather specialised ingredient. 125g/1 & 1/3 c best dark cocoa (I use Green & Black’s, but Rowntree is lovely too, and of course Valrhona would be divine). The fabulous David Lebovitz discusses cocoa here. Pop everything into a food processor and whiz briefly until well-combined. 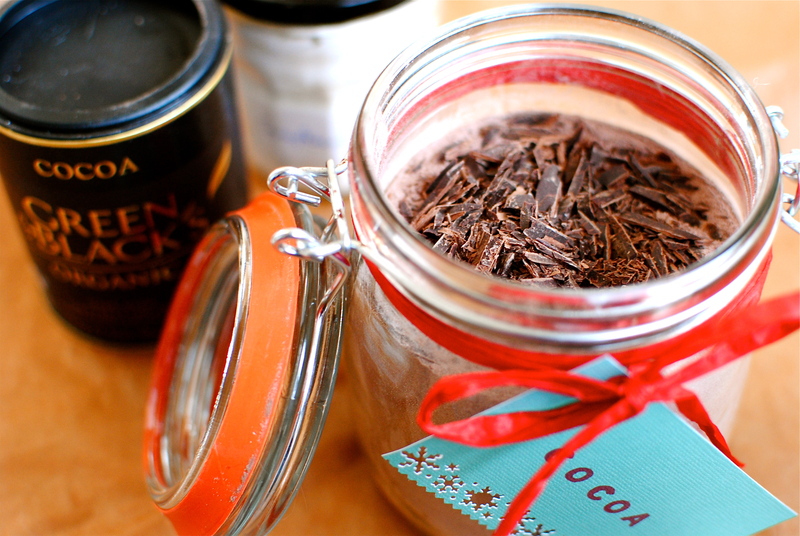 Decant into a large jar or canister and sprinkle over the remaining grated chocolate if you are giving it away. How to use: Put 4-5 heaped tablespoons of mix into a mug, pour in half a mug full of boiling water, give a good stir or use a little battery whisk (love my Union Jack Aerolatte – another gift idea), then stir in the rest of the water. 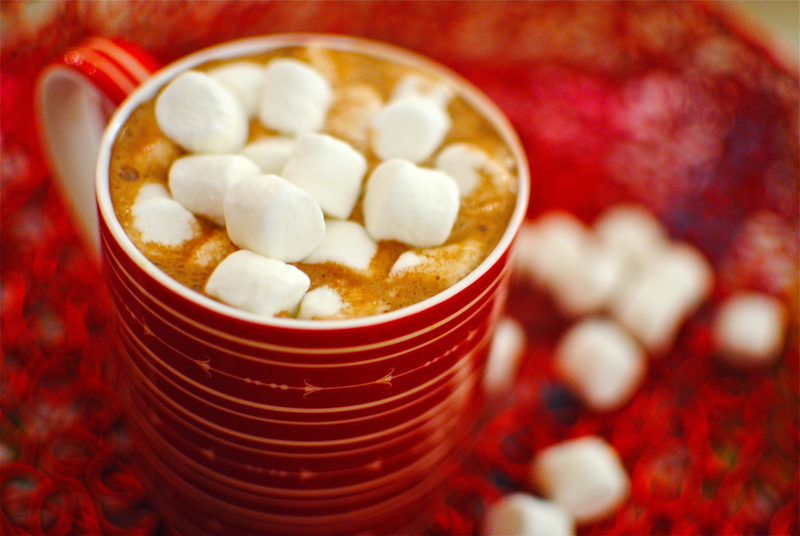 Top with mini marshmallows, grated chocolate, whipped cream and cinnamon – whatever takes your fancy. This one is slightly less intensely chocolately, with a touch more unrefined icing sugar, no cayenne and a smidge of vanilla. Often kids love cardamom so sprinkle that in if you like. Proceed as above. Marshmallows, obligatory! Lactose-intolerant? You could try using equivalent amounts of rice powder (try a Japanese retailer) or soy powder, but I haven’t tried it. Let me know if you do please! You could also make this mix without the dry milk and prepare it with the non-dairy milk of your choice. For this I think it is best to make a smooth paste with a bit of cold ‘milk’ , then top up with hot ‘milk. Thanks for this wonderful recipe. This would go perfect with my chocolate candycane dipped marshmallow’s that i posted the other day! THANK YOU so much for a wonderfully seasonal post and such wonderful recipe ideas too! Thanks you for your lovely comments, Karen. I am looking forward to catching up with your blog over the festive break! 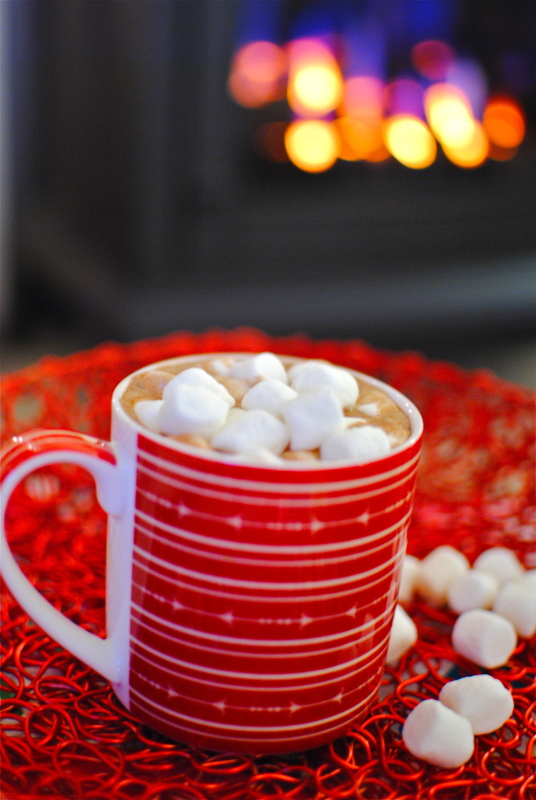 I am actually drinking hot cocoa as I read your post! Very timely. 🙂 Both recipes look wonderful, I will definitely be trying your Mexican Hot Cocoa!